When I first started this site 7 years ago, it was a quick and easy decision to call it COLOURlovers: It was all about color for people who loved it. But now with 1.5M members from around the world who have loved, err, liked more than 10,000,000 pieces of shared content... I think we can all agree, that's just too much love! It's also worth noting that in the current state of the world with ongoing wars, political tension, financial implosions... What the world really doesn't need is more love. That's why I'm super excited to share with you the new & waaaay better COLOURlikers! It's just like the old COLOURlovers, but now without any of the love. What has love ever done anyway?! You're all probably used to liking things on Facebook anyway, so this should be an easy transition. So go check out the profiles of other likers. 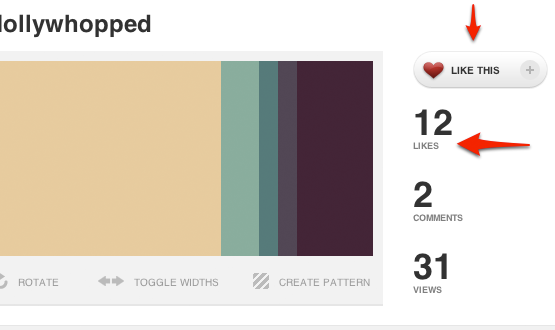 Go like some palettes or patterns. Share the like! Don't worry, we're kidding. Happy April Fools. We still love you. Are you going to change the name to COLOURlikers? We dream the same dream we want the same thing! April fools!!!! It's GOTTA be! Ha! You almost got me :P.
Wonderful. I was reading that message and saying, "Um..". Ok ok.. Ya'll got me. This is a joke right? lol this is so funny yesterday I made this palette and I named it " because you l o v e d me" and now it's name is because you liked me , so funny! I couldnt understand what happened! ???? here I see it as " because you l o v e d me" whats going on lol!!! Lol, even though April Fools Day is nearly over in Australia I knew what this was as soon as I saw it - there's no such thing as too much colour love!